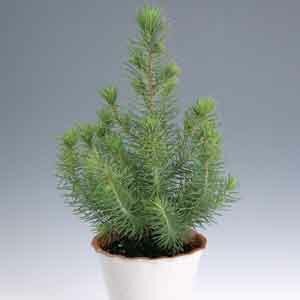 A charming conifer that brings the feel of a pine forest indoors. In nature this tree is found all along the Mediterranean coastline. In a home it’s a beautiful decorative accent near a sunny window or placed outdoors on a patio, deck or balcony. Useful for interiors, porches or patios. Beautiful when used as a pair on either side of an entranceway. Where hardy, in regions that temperatures stay above 20°F or -7°C, it can be planted in the landscape to grow slowly into a 50' (15m) tree.